A NEW DEMONSTRATION by Occupy protesters was shut down by gardaí last night, just hours after it was set up outside the Dáil. Activists set up the protest, dubbed Occupy The Dáil, on Molesworth Street facing the gates of Leinster House yesterday afternoon. It was supported by the Occupy Dame Street movement and publicised via their Facebook and Twitter pages. But gardaí quickly ended the action, first confiscating tents and other equipment and then moving the protesters themselves on, a campaigner told TheJournal.ie. He said three activists including himself were arrested, and videos appear to show protesters being taken into custody. However, it was not possible to confirm this with gardaí at the time of writing. “With the referendum [on the fiscal treaty] coming up we were hoping to turn it into a proper encampment,” Steven Bennett, a member of Occupy, said. He added that the group went to “substantial effort” to ensure that no obstruction was caused to the public, but gardaí had still moved them on. Gardaí have been “stepping up” their actions around Occupy events since the closure of the camp outside the Central Bank, he said. After their tents and placards were taken, Occupy members pulled barricades into the road and mounted a “people’s blockade” of the Dáil, Bennett said. The barricades were then removed by gardaí and three protesters including Bennett arrested. They were released early this morning. Bennett said there was no immediate plan to return to the Dáil but said the group plan a “substantial action” ahead of the referendum on the fiscal compact, to highlight a perceived lack of impartial information about the treaty. There was debate today on the Occupy Dame Street Facebook page about the organisation of last night’s protest, which started when one member began a demonstration and appealed to others for support. One poster said the event was “badly organised”, adding “hardly anyone knew this was going to happen” as well as highlighting other perceived issues. Email “Occupy The Dáil action shut down by gardaí”. 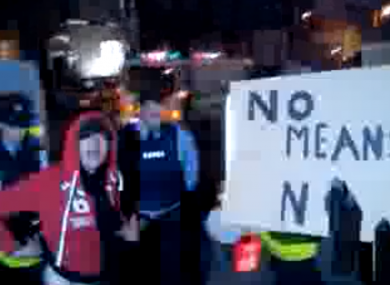 Feedback on “Occupy The Dáil action shut down by gardaí”.